During the three years Vonda Pelto spent counseling serial killers at Los Angeles Men’s Central Jail, it was Freeway Killer William Bonin with whom she spent the most time and got to know the best. 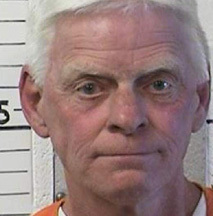 He was the ringleader with a number of accomplices over the years, after killing by himself early on, and Gregory Miley and James Munro were two of them and both were serving life sentences at Mule Creek State Prison in Northern California as May 2016 began. Munro and Miley communicated with Vonda and volunteered details of their crimes and what they did with and knew about William Bonin. 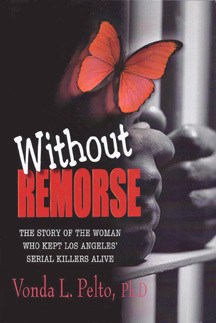 On December 14, 2015 an interview with Vonda Pelto, author of Without Remorse: The Story of the Woman Who Kept Los Angeles’ Serial Killers Alive with a second book on the Freeway Killers almost done, was broadcast nationally on Crime Watch Daily and uploaded to the CWD You Tube Channel. This is a pretty intense interview, over eight minutes, and it focused on the Freeway Killers and went into how and when they raped, tortured and murdered scores of young boys around Southern California. There are different estimates about how many boys were killed and in prison their crimes don’t rate well in that twisted code of conduct pyramid. Apparently one of inmates at Mule Creek saw Vonda’s interview on Crime Watch Daily TV and Vonda was told by Gregory Miley, over the phone on the morning of May 25, 2016, that he was scared for his life. 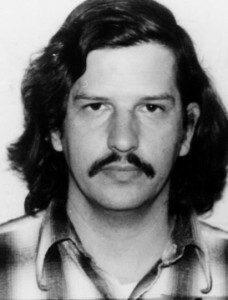 Later that day he was beaten to death by one of the inmates and Vonda, knowing that fellow Freeway Killer James Munro was also at Mule Creek, rang up the authorities to warn them he might also be targeted. They dismissed the warning and told of her “everyone knows Munro is a Freeway Killer.” So far nothing has happened to Munro and no one has been identified as a suspect in the Gregory Miley killing. For more on how events played out, and the fallout from Vonda’s Crime Watch Daily TV interview, listen to her May 27, 2016 interview with John Phillips and Jillian Barberie, featured below, on KABC Radio, Los Angeles, during the afternoon Drive Home Show. Vonda is putting the finishing touches on a book about the Freeway Killers and interviews with Gregory Miley and James Munro were helpful to that project. A new one-hour program covering the most compelling aspects of the world of crime, mystery and intrigue, Crime Watch Daily is the very first crime show to air in daytime syndication. From unsolved murders to must-see mysteries, undercover investigations and shocking crimes caught on video, the series will uncover the stories happening in small towns around America and turn them into national headlines. The key ingredients of “Mystery, Crime and Drama” will drive every episode. 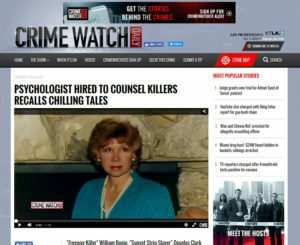 Crime Watch Daily‘s network of affiliate stations will serve as an “extended newsroom,” sharing resources and using local reporters to cover the stories in local markets all over the country. Acclaimed Australian crime journalist and reporter Matt Doran will serve as host of Crime Watch Daily, joined by a formidable team of correspondents: Emmy® Award–winning reporters Michelle Sigona and Andrea Isom, as well as New York Times bestselling author Jason Mattera.